Should a psychic network really be this much fun? The answer is an emphatic “yes” if the network is BitWine, the only online psychic network that provides 50% off Psychic Happy Hours, $10 Deals and a really nifty store that’s chock-full of with ritual candles, spiritual oils, herbs & roots and baths & washes. But don’t think for a minute that BitWine doesn’t take psychic reading seriously. Indeed it does. Founded nearly a decade ago, the Online Psychic Network by BitWine is the home of more than 3,000 genuine psychics and spiritual advisors from across the globe. 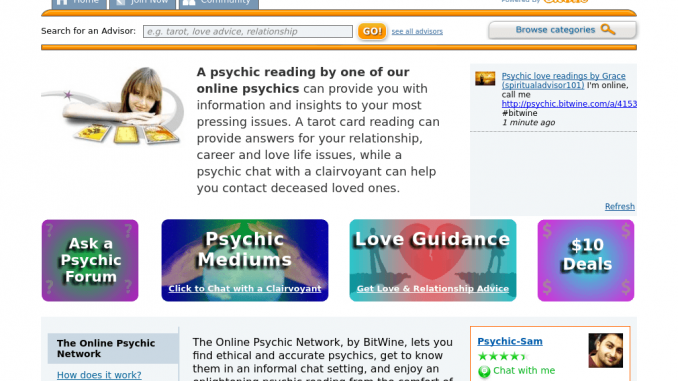 Through BitWine’s pairing with Skype and PayPal, it’s also one of the safest and most confidential ways to connect to psychics online in an informal chat setting. You’ll find a wide selection of expert psychics here, specializing in everything from astrology readings, love guidance, meditations, new age and parapsychology to psychic healing, Reiki, spiritual coaching, spiritualism, tarot card readings, and the occult. Just browse their profiles, check out their credentials, experience, rating and client reviews, make sure they’re online, and then chat with them for free by clicking the “Chat with Me” button. Or if you prefer, invite the psychic of your choice to a voice or video dialogue. Then ask whatever’s on your mind: Is your boyfriend sincere or is he wasting your time? Is it time to move on from your dead-end job? What does the universe have in store for you? If you’re looking for a special type of psychic advisor, there’s a search box to enter your specific keywords (e.g., tarot, love advice, relationship) and the site will bring up just the right psychic advisors for you. Or if you prefer, browse categories such as spiritual coaching, new age or the occult and connect with advisors that way. Don’t know which psychic to contact? Go to the BitWine Community Forum. You can get psychic recommendations or even get a fast answer to a spirituality question. BitWine is passionate about confidentiality. Unlike other sites, it doesn’t require a credit card or banking information; all transactions are performed directly with PayPal, the safest and easiest way to pay online. In fact, you’re not even required to reveal your real name. So you can move forward with your advisor, knowing you are 100% protected. And then there are the fun parts. Happy Hour is universally loved in the hospitality industry so why not expand it into the psychic industry? That’s what BitWine was determined to do and it pays off, both for them and most of all, for psychic seekers like you. You can anticipate 50% savings on every advisor’s per-minute rate every day between 10-11 pm, EST (7-8 PST). Topping off the discount, BitWine provides free tarot readings for winning forum posters that are chosen randomly each week. The only requirement is to start your post with these words: “I need a free tarot reading because…” or end your post with “…and this is why I need a free tarot reading.” Who knows, you could be the fortunate winner! In addition, various psychics post their version of a $10 deal. At any given day, the $10 deal could be $10 = 15 minutes, an angel card reading with five questions for $10, a $10 lover’s reading, or any offer that their psychics decide to create. Last but not least is the store! There’s nothing quite like it from any other psychic network. It’s stocked with more than 10,000 items from Original Products including candles, talismans, crystals and essential oils at a special discount. You can shop by desire (such as fast luck, success & prosperity or love & attraction) or by a specific product. It’s a great way to take your love of the psychic world to the next level even after your reading ends. It’s easy to get started. Just take advantage of the free chat and voice/video introductory session and when you’re ready to move forward, let him or her know. You will be charged a per-minute rate – as low as $0.50 per minute – and just before the end of your call, the amount you’ve agreed upon will be debited from your PayPal account. Add it all up – hundreds of genuine and sincere psychics just waiting to provide you with greater clarity, a whole new level of confidentiality, great pricing and extras and so much more. It’s no wonder that BitWine is a winner!